When I was eight, I saw the movie Rocky. Intellectuals like to trash the film, but the American Film Institute places it at number 57 on the list of the greatest movies of all time. I think it is a wonderful film, both on the intellectual and emotional levels. Sure, I am biased. I saw it when I was eight; I'm an Italian American; it was shot in Philadelphia, where I was born... But the more educated I get and the older I get, the more I like the movie and the more I see the beauty of Rocky Balboa, the character. The metaphor is perfect. Rocky was never a movie about boxing. Rocky Balboa is all of us, "fighting" to prove one thing to ourselves: that we are worth something. But the real philosophical merit of the story is that Rocky never wants to be famous; he just wants to remain standing at the end of fifteen rounds with the heavyweight champion. And that's what happens. Rocky doesn't win the fight; he stays on his feet (with a little help, after the bell, from his beloved Adrian [which is perfect, too]). Then came the middle movies: Rocky II, through V. Maybe not what you would call masterpieces -- not on the level of the first one -- but one thing never changes: Rocky refuses to quit and Rocky never stops being a good-hearted, vulnerable and passionate person. He fights people he has no prayer of beating and he beats them. It's a bullet-proof formula, even in what is maybe the weakest of the movies, Rocky V. They are all good popcorn movies, but, no matter the shell, Rocky Balboa manages to remain both a metaphor and a person. I'm not going to try to "save face" through cynicism. I'm not going to equivocate about Rocky. There's no "but seriously" coming. 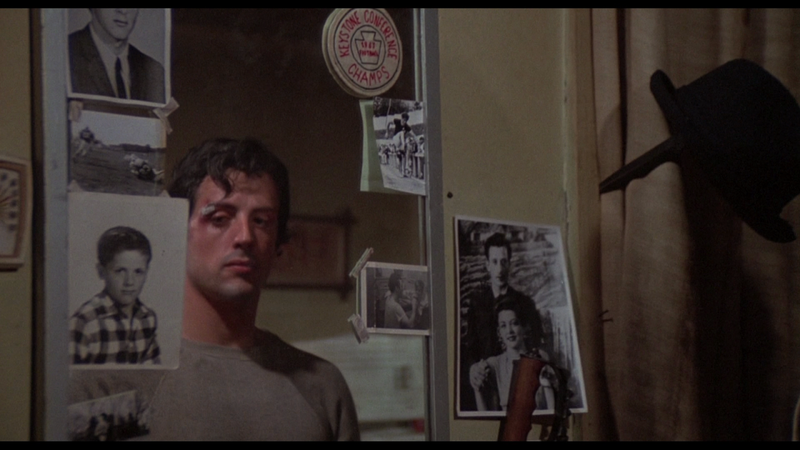 Even the legendary Roger Ebert saw something in young Stallone, saying the young actor reminded him of a young Brando. (Ebert also gave Rocky 4/4 stars.) I think Stallone has proven he can be a great filmmaker, in his own right, and I think he was nothing short of brilliant in the last Rocky film, Rocky Balboa. And here's where the "not-a-movie-review" part comes in: There are many ways into a man's heart. Mine contains many doors. One of them says "Rocky." "Let me tell you something you already know. The world ain’t all sunshine and rainbows. It’s a very mean and nasty place and I don’t care how tough you are it will beat you to your knees and keep you there permanently if you let it. You, me, or nobody is gonna hit as hard as life. But it ain’t about how hard ya hit. It’s about how hard you can get hit and keep moving forward. How much you can take and keep moving forward." That really is wisdom, even if it comes from the mouth of a boxer (and an "action star") who stuffy pseudo-intellectuals might tend to blow off. That's who Rocky is and that's who we all should be: people who won't quit but people who never try to win through self-betrayal or dishonesy. With that in mind, the end of the movie had a profound effect on me that night last week. Rocky faces a young boxer and The Italian Stallion does what he once had to do as a young man: fights hard and stays on his feet, despite his age. Rocky bows out of boxing (really, out of his own fictional life) like a man. He does what he is and he refuses to quit, even after he should have. But that part that moves me the most; the part that lead me into a week-long examination into my own soul is what happens after the fight. Rocky's son embraces him and says: "That was the greatest thing I have ever seen." Stallone gets it. So do I. There are only two people in the world I want to be a hero for: my sons. We all have to face getting older; we all have to consider death. I want my boys to see their dad and to remember their dad as a fighter. I already said it: Stallone was never afraid to make Rocky vulnerable or self-doubting. He's not a mindless hammer who proves his worth with his fists alone. Rocky is a man. You can keep intellectuality and you can keep material possessions. Let my boys remember me as a "fighter" with a good heart. 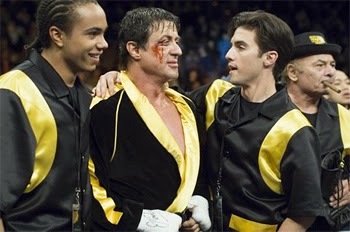 And, win, lose or draw, I hope at my funeral they feel like Rocky's boy did at the end of that fight. The Rocky movies nearly pushed me into boxing (instead I took karate, though I still wish I did the former). Honestly, I've never had a movie touch me as the first one did. I fully agree with you, it was a masterpiece. On a slightly unrelated note, I heard one of the teachers at your school recently passed. I'm very sorry. I've heard so many stories about him, and I know he'll be greatly missed. Yeah, it's funny, Alexis -- I wantyed to box for years after the movie. Then, I realized there is nothing fun about being punched in the face. The little English major in me went. "Wait -- it's the meatphor, not the boxing I want..."
Thanks for the condolences. He was a guy who spent all but four years of his life (college) at our school as teacher and as student. A good egg.